Adds 87 new pieces of enchanted jewelry to the game that could normally only be made at an enchanting table but never found as loot or sold in stores. This mod adds 87 new pieces of enchanted jewelry to the game that could normally only be made at an enchanting table but never found as loot or sold in stores. I made this simply because I wanted a way to get those items without having to make them myself. The naming of the jewelry, the level it appears and its effect all follow their armor equivalents so the new items should blend into the game fairly seamlessly. 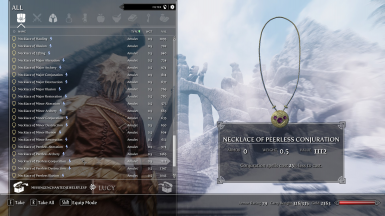 Overall, the enchanted jewelry available to find should now exactly match what it is possible to make at an enchanting table (minus the unique enchantments like unarmed). Since rings of Stamina Regeneration already exist in the game, this mod also allows rings to be enchanted with Fortify Stamina Regen. The number in brackets is the level you need to reach before the item will appear. Ring of Minor Alchemy (1) Created potions are 12% more powerful. Ring of Alchemy (8) Created potions are 15% more powerful. Ring of Major Alchemy (16) Created potions are 17% more powerful. Ring of Eminent Alchemy (24) Created potions are 20% more powerful. Ring of Extreme Alchemy (32) Created potions are 22% more powerful. Ring of Peerless Alchemy (40) Created potions are 25% more powerful. Ring of Lifting (1) Carrying capacity increased by 25 points. Ring of Hauling (8) Carrying capacity increased by 30 points. Ring of Strength (16) Carrying capacity increased by 35 points. Ring of Brawn (24) Carrying capacity increased by 40 points. Ring of the Ox (32) Carrying capacity increased by 45 points. Ring of the Mammoth (40) Carrying capacity increased by 50 points. Ring of Disease Resistance (10) Increases Disease Resistance by 50%. Ring of Disease Immunity (20) Increases Disease Resistance by 100%. Ring of Resist Fire (1) Increases Fire Resistance by 15%. Ring of Waning Fire (8) Increases Fire Resistance by 30%. Ring of Dwindling Fire (16) Increases Fire Resistance by 40%. Ring of Flame Suppression (24) Increases Fire Resistance by 50%. Ring of Fire Abatement (32) Increases Fire Resistance by 60%. Ring of the Firewalker (40) Increases Fire Resistance by 70%. Ring of Resist Frost (1) Increases Frost Resistance by 15%. Ring of Waning Frost (8) Increases Frost Resistance by 30%. Ring of Dwindling Frost (16) Increases Frost Resistance by 40%. Ring of Frost Suppression (24) Increases Frost Resistance by 50%. Ring of Frost Abatement (32) Increases Frost Resistance by 60%. Ring of Warmth (40) Increases Frost Resistance by 70%. Ring of Poison Resistance (5) Increases Poison Resistance by 50%. Ring of Poison Immunity (10) Increases Poison Resistance by 100%. Ring of Resist Shock (1) Increases Shock Resistance by 15%. Ring of Waning Shock (8) Increases Shock Resistance by 30%. Ring of Dwindling Shock (16) Increases Shock Resistance by 40%. Ring of Shock Suppression (24) Increases Shock Resistance by 50%. Ring of Shock Abatement (32) Increases Shock Resistance by 60%. Ring of Grounding (40) Increases Shock Resistance by 70%. Ring of Waterbreathing (1) Can swim underwater without drowning. Necklace of Minor Alteration (1) Alteration spells cost 12% less to cast. Necklace of Alteration (8) Alteration spells cost 15% less to cast. Necklace of Major Alteration (16) Alteration spells cost 17% less to cast. Necklace of Eminent Alteration (24) Alteration spells cost 20% less to cast. Necklace of Extreme Alteration (32) Alteration spells cost 22% less to cast. Necklace of Peerless Alteration (40) Alteration spells cost 25% less to cast. Necklace of Minor Archery (1) Bows do 15% more damage. Necklace of Archery (8) Bows do 20% more damage. Necklace of Major Archery (16) Bows do 25% more damage. Necklace of Eminent Archery (24) Bows do 30% more damage. Necklace of Extreme Archery (32) Bows do 35% more damage. Necklace of Peerless Archery (40) Bows do 40% more damage. Necklace of Lifting (1) Carrying capacity increased by 25 points. Necklace of Hauling (8) Carrying capacity increased by 30 points. Necklace of Strength (16) Carrying capacity increased by 35 points. Necklace of Brawn (24) Carrying capacity increased by 40 points. Necklace of the Ox (32) Carrying capacity increased by 45 points. Necklace of the Mammoth (40) Carrying capacity increased by 50 points. Necklace of Minor Conjuration (1) Conjuration spells cost 12% less to cast. Necklace of Conjuration (8) Conjuration spells cost 15% less to cast. Necklace of Major Conjuration (16) Conjuration spells cost 17% less to cast. Necklace of Eminent Conjuration (24) Conjuration spells cost 20% less to cast. Necklace of Extreme Conjuration (32) Conjuration spells cost 22% less to cast. Necklace of Peerless Conjuration (40) Conjuration spells cost 25% less to cast. Necklace of Minor Destruction (1) Destruction spells cost 12% less to cast. Necklace of Destruction (8) Destruction spells cost 15% less to cast. Necklace of Major Destruction (16) Destruction spells cost 17% less to cast. Necklace of Eminent Destruction (24) Destruction spells cost 20% less to cast. Necklace of Extreme Destruction (32) Destruction spells cost 22% less to cast. Necklace of Peerless Destruction (40) Destruction spells cost 25% less to cast. Necklace of Minor Illusion (1) Illusion spells cost 12% less to cast. Necklace of Illusion (8) Illusion spells cost 15% less to cast. Necklace of Major Illusion (16) Illusion spells cost 17% less to cast. Necklace of Eminent Illusion (24) Illusion spells cost 20% less to cast. Necklace of Extreme Illusion (32) Illusion spells cost 22% less to cast. Necklace of Peerless Illusion (40) Illusion spells cost 25% less to cast. Necklace of Minor Restoration (1) Restoration spells cost 12% less to cast. Necklace of Restoration (8) Restoration spells cost 15% less to cast. Necklace of Major Restoration (16) Restoration spells cost 17% less to cast. Necklace of Eminent Restoration (24) Restoration spells cost 20% less to cast. Necklace of Extreme Restoration (32) Restoration spells cost 22% less to cast. Necklace of Peerless Restoration (40) Restoration spells cost 25% less to cast. Circlet of Minor Lockpicking (1) Lockpicking is 15% easier. Circlet of Lockpicking (8) Lockpicking is 20% easier. Circlet of Major Lockpicking (16) Lockpicking is 25% easier. Circlet of Eminent Lockpicking (24) Lockpicking is 30% easier. Circlet of Extreme Lockpicking (32) Lockpicking is 35% easier. Circlet of Peerless Lockpicking (40) Lockpicking is 40% easier. Circlet of Recharging (16) Magicka regenerates 40% faster. Circlet of Replenishing (24) Magicka regenerates 60% faster. Circlet of Resurgence (32) Magicka regenerates 80% faster. Circlet of Recovery (40) Magicka regenerates 100% faster. Should be compatible with any mod that doesn't edit the enchanted jewelry leveled lists. For those who check for conflicts in xEdit, the LItemEnchRingSkillStealth conflict with USLEEP is intentional. They removed an unused list that is now being used again.